The sage plant Salvia officinalis L. is used as ingredient in foods and beverages as well as in herbal medicinal products. A major use is in the form of aqueous infusions as sage tea, which is legal to be sold as either food or medicine. Sage may contain two health relevant substances, thujone and camphor. The aim of this study was to develop and validate an analytical methodology to determine these active principles of sage and give a first overview of their concentrations in a wide variety of sage foods and medicines. 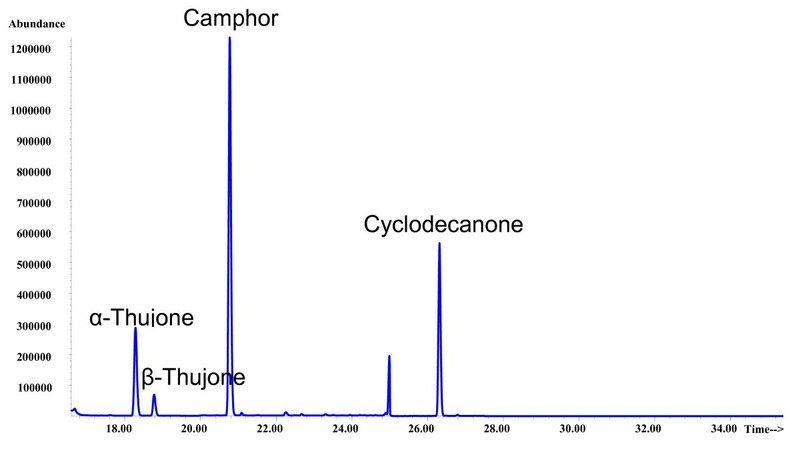 A GC/MS procedure was applied for the analysis of α- and β-thujone and camphor with cyclodecanone as internal standard. The precision was between 0.8 and 12.6%, linearity was obtained from 0.1 - 80 mg/L. The recoveries of spiked samples were between 93.7 and 104.0% (average 99.1%). The time of infusion had a considerable influence on the content of analytes found in the teas. During the brewing time, thujone and camphor show an increase up to about 5 min, after which saturation is reached. No effect was found for preparation with or without a lid on the pot used for brewing the infusion. Compared to extracts with ethanol (60% vol), which provide a maximum yield, an average of 30% thujone are recovered in the aqueous tea preparations. The average thujone and camphor contents were 4.4 mg/L and 16.7 mg/L in food tea infusions and 11.3 mg/L and 25.4 mg/L in medicinal tea infusions. The developed methodology allows the efficient determination of thujone and camphor in a wide variety of sage food and medicine matrices and can be applied to conduct surveys for exposure assessment. The current results suggest that on average between 3 and 6 cups of sage tea could be daily consumed without reaching toxicological thresholds. The sage plant Salvia officinalis L. is a common ingredient used to flavour certain foods and beverages, especially in the Mediterranean diet (e.g. saltimbocca, a dish made of veal topped with ham and sage leaves). Sage is also used as an herbal medicinal product sold in the form of plant materials for making herbal tea, or as liquid extract or tincture. Depending on the intended use, sage is therefore regulated either as food or as medicine. In a recent toxicological review on thujone, which is a neurotoxic constituent of the essential oil of sage, we noted that the food and medicine laws contain a discrepancy . The European food law recently deregulated the use of thujone-containing plants in food, i.e. both the previous limit for foodstuffs containing preparations based on sage (25 mg/kg) and the general limit for foodstuffs (0.5 mg/kg)  were removed from the new flavouring regulation, and only Artemisia-containing beverages (i.e. mainly absinthe) remain regulated . This means that Salvia officinalis and other thujone-containing flavouring plants (besides Artemisia in beverages) can now be used in foods without restrictions. Nevertheless, thujone as such (i.e. in chemically pure form) is not allowed to be added to foods; it may only be indirectly introduced into foods by use of thujone-containing plants . While the restrictions for foods have been lowered, the opposite has occurred for herbal medicines. The European Medicines Agency (EMA) has recently implemented an acceptable daily intake (ADI) of 5.0 mg/person for a maximum duration of use of 2 weeks in their Salvia officinalis monograph . In a recent public statement, the EMA has reacted to new scientific evidence and now calls a range of exposure between 3 and 7 mg/day as acceptable without concern, while proposing a new ADI of 6 mg/person . These regulatory differences lead to the strange situation wherein basically the same product (sage tea) may be marketed as food without any restriction, while its marketing as medicine in drug stores and pharmacies is regulated and certain warning labels are even required, such as "sage preparations should not be taken for more than 2 weeks" or "may impair ability to drive and use machines". In addition, its use by children and adolescents under 18 years of age is not recommended . There is currently a scarcity of literature data regarding the thujone content of sage products on the market. For sage tea, our detailed literature review  detected only one report based on actual analytical data of a sage tea, which contained 2.0 μg/ml of thujone (2 g of dried plant material in 150 ml boiling water, steeped for 5 min), corresponding to 0.3 mg per cup . Only 2.99% of essential oils were extracted during the preparation of such a tea . The EMA  provided model calculations based on analytical data on essential oil yield and essential oil composition of Salvia officinalis folium using results from the study conducted by Länger et al. . For an amount of 1 g sage leaves per 150-ml cup of hot water, the EMA assumed a thujone content ranging between 0.7 mg and 5.0 mg per cup, based on 3% essential oil containing 10-60% α-thujone and 4-36% β-thujone and 17.6% extraction during tea steeping. This model calculation therefore led to a higher thujone content in a cup of sage tea than in the analytical data. We previously warned against model calculations based on essential oil analyses in the context of thujone estimation in absinthe . Similar to wormwood, the thujone content in sage is highly variable. Typically, three chemotypes with low (9%), medium (22-28%), and high (39-44%) thujone contents are differentiated . Thujone content also depends on drying conditions , harvest time and seasonal variation [10, 12, 13], geographic and climatic conditions [14, 15] and fertilization , and it shows a gradient even inside a single individuum . Sample preparation using steam distillation or solvent extraction may also have an influence . The relative amount of essential oil constituents may also change during aqueous extraction due to the different solubilities: e.g. Lima et al. reported 17.4% α-thujone in the essential oil, but 34.0% was contained in the essential oil fraction extracted from sage tea. While methods for the reduction of thujone in pharmaceutical preparations appear to be available , this practice may be in violation of the ISO 9909 standard, which specifies a range of 18.0-43.0% of α-thujone and 3.0-8.5% of β-thujone . The European Pharmacopoeia also requires that sage leaf oil is "rich" in thujone, however without specifying a range . For these reasons, we think that only actual analytical data are sufficient for risk assessment of thujone in sage products. 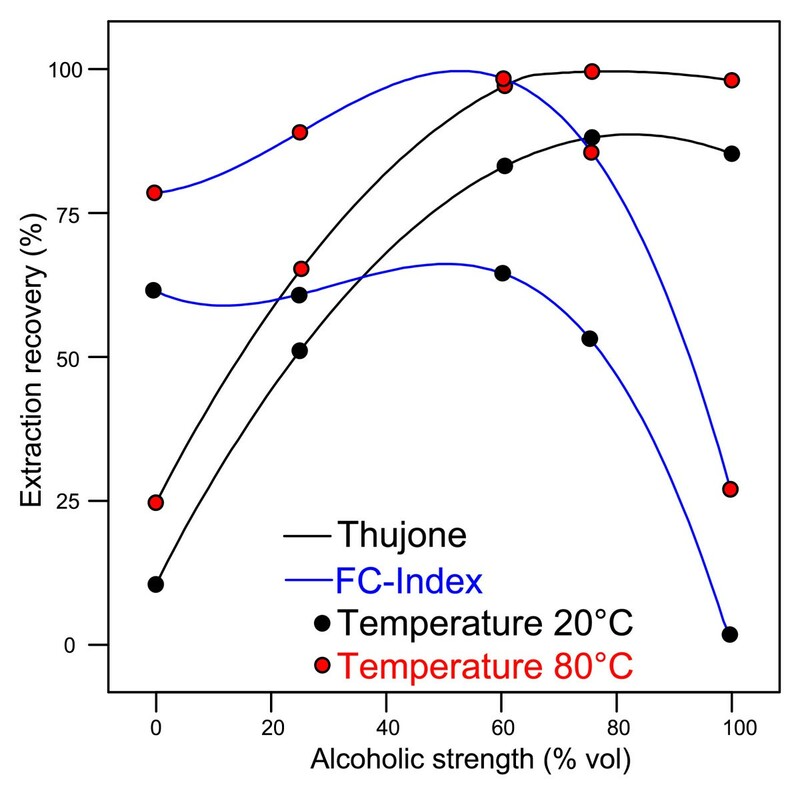 To fill this void in the literature, this study provides an analytical methodology based on our previously validated GC/MS procedure for analysing thujone in alcoholic beverages . We also included camphor in the quantitative analysis, as this substance may also be health-relevant according to EMA . The procedure was then applied to analyse a large sample collective (n = 86) of sage foods and medicines. Sage-containing foods and medicines were purchased between March and July 2010 in wholesale and retail supermarkets, drug stores, health food shops and pharmacies. We aimed to gather all available products and brands and therefore backordered further items at a pharmaceutical wholesale outlet. For several items, we ordered more than one package in order to gather data on charge variations. The sampling can be seen as representative for the current trade with sage products on the German market. For sage tea, infusions were generally prepared according to the standard protocol specified in DIN 10809/ISO 3103 . A 150-mL white porcelain pot with lid was used. Deviating from the standard protocol, (which is for Camellia sinensis based tea), we used 1.5 g of herbal tea material (or 1 tea bag) instead of 2.0 g per cup, as this more realistically conforms to the specification as prescribed by the manufacturer on the labelling. In general, the tea material was infused in 150 mL of hot water for 15 min. For comparison purposes, the same infusion was made using ethanol (60% vol) instead of water. To further study the influences of tea preparation, one of the samples was extracted using different alcoholic strengths (0, 25, 60, 75 and 99% vol) at two different temperatures (20°C and 80°C). The aqueous and alcoholic infusions were then directly used for extraction. Because the act of the tea preparation might also have an influence, 10 different teas were prepared with the lid of the pot either opened or closed. As a final experiment, the thujone extraction was studied during infusion in two brands by multiple samplings during 0 to 15 min infusion time. For liquid products (medicinal sage extracts and tinctures), the product was diluted into the required concentration with ethanol (60% vol), typically 1:50 or 1:100. Solid products (sage sweets/candy) were homogenized in a laboratory mill and 10 g were dissolved in ethanol (60% vol) under ultrasonication and mild warming. Fresh and dried sage plants (sold as spice) were prepared by homogenization of 30 g of plant material in 250 mL of ethanol (60% vol). The resulting solution was filtrated and diluted into the required concentration (typically 1:50). All products were analyzed as is without physical alteration, i.e. in the form to be used by consumers. No drying steps (e.g. for the fresh products) were conducted and all results refer to fresh weight. The extraction of the prepared solutions (i.e. the aqueous tea infusion as well as the homogenized or diluted solutions in the case of other products) was accomplished using a previously described procedure for the determination of thujone in alcoholic beverages , which was extended for the analysis of camphor. The procedure was based on the liquid-liquid-extraction with 1,1,2-trichloro-1,2,2-trifluoroethane first proposed by Rapp et al. . After the addition of 350 μL of cyclodecanone as internal standard (freshly prepared methanolic solution, 20 μg/mL), 1 mL of the sample was shaken with 10 mL of ethanol (15% vol) and 1 mL of 1,1,2-trichloro-1,2,2-trifluoroethane for 60 s and centrifuged at 3.000 rpm for 5 min for phase separation. The lower organic phase was drawn off using a transferpettor and filled in a GC vial. For calibration, thujone and camphor solutions (0.1-80 mg/L) were freshly prepared in ethanol (15% vol) and extracted as the samples. The organic extracts were stored at 4°C until analysis. The GC-MS system used for analysis was an Agilent model 6890 Series Plus gas chromatograph in combination with a CTC Combi PAL autosampler and an Agilent 5973N mass selective detector. Data acquisition and analysis were performed using standard software supplied by the manufacturer. Substances were separated on a fused silica capillary column (HP-Innowax, 60 m × 0.25 mm I.D., film thickness 0.25 μm). Temperature program: 45°C hold for 1 min, 5°C/min up to 180°C, 25°C/min up to 240°C, hold for 5 min. The temperatures for the injection port, ion source, quadrupole and interface were set at 240°C, 230°C, 150°C, and 250°C, respectively. Split/splitless injection port (1 μL, splitless) and helium with a flow rate of 1.0 mL/min as carrier gas were used. To determine the retention times and characteristic mass fragments, electron impact (EI) mass spectra of the analytes were recorded by total ion monitoring. The analytes α-thujone, β-thujone, and camphor, as well as the internal standard cyclodecanone were baseline separated. The retention times were 20.75 min for camphor, 18.29 min for α-thujone, 18.78 min for β-thujone, and 26.36 min for cyclodecanone. For quantitative analysis, the chosen diagnostic mass fragments were monitored in the selected ion monitoring (SIM) mode. Camphor: m/z 108 as target ion and m/z 109, 152 as qualifier ions; α-/β-thujone: m/z 110 as target ion and m/z 81 and 152 as qualifier ions; cyclodecanone: m/z 111 as target ion and m/z 98 and 154 as qualifier ions. For quantification, peak area ratios of the analytes to the internal standard were calculated as a function of the concentration of the substances. The limit of detection was 0.08 mg/L  for thujone and 0.02 mg/L for camphor. For further validation of the method, quality control samples were prepared and analysed using the procedure described above. Precision and recovery were determined with and without sample preparation. The data with sample preparation were gathered by analysing several different packages of the same batch. All phenolic compounds contained in the sample were oxidized by Folin-Ciocalteu (FC) reagent. This reagent is formed from a mixture of phosphotungstic acid, H3PW12O40, and phosphomolybdic acid, H3PMo12O40, which, after oxidation of the phenols, is reduced to a mixture of blue oxides of tungsten, W8O23, and molybdenum, Mo8O23. The blue colouration produced has a maximum absorption in the region of 750 nm and is proportional to the total quantity of phenolic compounds originally present. The FC-Index was determined according to the reference procedure for wine analysis  using a commercial FC reagent (Merck, Darmstadt, Germany, No. 1.09001.0100). To prepare the samples, 200 μL of sage tea (from the infusion described above), 10 mL of distilled water, 1 mL of FC reagent, and 4 ml of sodium carbonate solution (20%, m/v) were placed into a calibrated 20 mL flask and filled up to the mark with distilled water. After a period of 30 min required for stabilization of the blue colour formed, the absorbance at 750 nm was measured. The result is expressed in the form of an index obtained by multiplying the absorbance by 20. We were able to transfer our previous procedure intended for alcoholic beverages to sage foods and medicines. Sage teas could be treated in a similar manner as alcoholic beverages. Sage tinctures and extracts sold as medicines only needed to be diluted into the calibration range. Only for solid foods was a further preparation step necessary to get the terpenes (α- and β-thujone, camphor) into solution, to be used for liquid-liquid-extraction. Furthermore, we wanted to evaluate the extraction yield from the plant material during sage tea preparation, and we therefore conducted an extraction experiment, with results shown in Figure 1. Up to 60% vol of alcohol, the extraction yield is considerably increased, while it remains constant if the alcoholic strength is further increased. The purely aqueous extraction (0% vol alcohol) yielded approximately 25% of the maximum yield. The extraction also depends on the temperature. Camphor shows the same extraction behaviour as thujone (data not shown). Because of these results, we extracted solid foods using 60% vol ethanol and made all dilutions using this alcoholic strength. Our result also confirms the observation in alcoholic beverages (absinthe) that the optimal strength is above 60% vol, while at lower strength the essential oils precipitate (which is sometimes desired in certain drinking rituals) . Extraction recovery of thujone and FC-Index using different alcoholic strengths at different temperatures (camphor exhibited exactly the same behaviour as thujone - data not shown). For sage food and medicines, an extractive sample preparation appeared to be obligatory, as the initial extracts are heavily coloured and would lead to matrix interferences as well as contamination of the GC inlet liner and MS ion source. Similar to our previous procedure, we therefore used a liquid-liquid extraction, which is comparably fast and easy to conduct. 1,1,2-Trichloro-1,2,2-trifluoroethane has the highest extraction efficiency of flavour compounds from alcoholic solutions (see e.g. [21, 23, 26, 27]). The advantage is that a complete extraction is reached in only one step, and we further controlled the extraction efficiency by applying an internal standard before the extraction and conducting extraction of all calibration samples. All analytes and the internal standard were baseline separated. A typical chromatogram is shown in Figure 2. The validation results are presented in Table 1. The calibration curves were constructed from peak areas using the SIM mode, and they show a linear relationship for α- and β-thujone and camphor with coefficients of correlation of 0.999. The linear range between 0.1 and 80 mg/L covers the thujone concentrations typically found in sage teas. Other products can be measured by dilution into this range. To improve quantitative analysis of essential oil compounds, the use of an internal standard was suggested . In our case, we applied cyclodecanone, which was proposed by Kröner et al. [29, 30] for the determination of thujone in absinthe. As we add the internal standard in the first step of the sample preparation process, not only changes during chromatography but also during extraction (e.g. due to differences in ethanol content for the herbal medicines) are corrected. In general, excellent precision was achieved, with ranges between 0.2 to 0.7% (without sample preparation) and 0.8 to 12.6% (including sample preparation). The recoveries of spiked samples were between 93.7 and 104.0% (average 99.1%). GC/MS-SIM chromatogram of a sage tea containing 5.7 mg/l of α-thujone, 1.3 mg/l of β-thujone and 18.7 mg/l of camphor. During the brewing time, the increase of thujone and camphor showed an almost linear behaviour up to about 5 min, after which saturation was reached (Figure 3). If risk assessments show that the exposure to thujone should be minimized, the consumer recommendation could be to reduce the infusion time, e.g. to about 3 min instead of 15 min. The behaviour of the extraction of polyphenols (i.e. the FC-Index), however, was almost similar in this case to that of the terpenes. The disadvantage of a reduced infusion time is, therefore, that the polyphenols (which are often attributed for the beneficial effects of sage ) are similarly reduced. A dependency between thujone and polyphenols in tea was also confirmed in our survey (Table 2), which proves significant positive linear correlations between FC-Index and α-thujone (R = 0.60, p < 0.001) and β-thujone (R = 0.67, p < 0.0001). However, this was not the case between FC-Index and camphor (R = 0.16, p = 0.39). 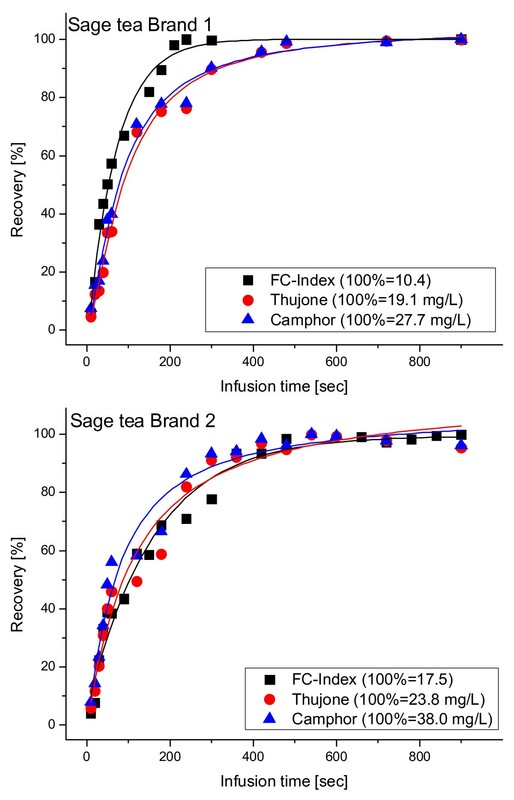 Dependence between infusion time and thujone, camphor and FC-index in two different sage tea brands. Interestingly, in the alcohol experiment (Figure 1), the extraction of the polyphenols did not exhibit the same behaviour as that of the terpenes. Approximately 80% of polyphenols are extracted without alcohol, whereas thujone is only at 25% (Figure 1). The polyphenols are only slightly increased up to 60%, and then decrease again. This is a first indication that the common aqueous preparation of a sage tea is preferable, as thujone is already avoided, while the polyphenols are still extracted at a very high degree. This was confirmed by our survey showing an average extraction of 30% thujone (range 14-48%) in aqueous tea preparations compared to extraction with 60% ethanol (Table 2). Finally, there were assumptions that the thujone content of sage tea could be higher if the tea was prepared using a lid on the pot. This could have two effects: (1) reduced evaporation and (2) increased extraction by reduced temperature decline over the infusion time. In our judgment, the first effect could be minor due to the comparably high boiling point of thujone (about 200°C, see Ref. ). From our 10 samples, which we analysed both with and without lids, no clear trend was detectable. The half of the samples without lids had higher contents and the other half had lower contents. The average content with lid was 0.3 mg/L higher than without lid, which is not a significant difference considering the precision of the method (ANOVA p = 0.92). This clearly disproves the hypothesis of a considerable effect of using a lid: therefore, no consumer recommendation is needed regarding the brewing method. We analyzed 39 herbal teas, of which 8 brands were sold as food and 31 products were sold as medicines (14 different brands). In general, in both product groups a comparably wide variance of results was detected, which confirmed the studies mentioned in the introduction [10–17]. This was further researched by looking at only one brand from which 18 different lots and product types (including tea bags) were analysed (Table 2). This confirms the high natural differences, as the total thujone contents in this single brand varied from 12.4 mg/L to 30.1 mg/L. The products sold as medicine had a tendency to higher thujone contents (sum of α- and β-thujone) from 0.2 to 30.1 mg/L (average 11.3 mg/L), and camphor contents from 2.3 to 55 mg/L (average 25.4), while the ones sold as food contained 0.2 to 14.1 mg/L thujone (average 4.4 mg/L) and 1.5 to 43.8 mg/L camphor (average 16.7 mg/L). The differences between foods and medicines are statistically significant on the 5% level for the thujones (ANOVA: α-thujone p = 0.022; β-thujone p = 0.012) but not for camphor (ANOVA p = 0.349) and FC-Index (ANOVA p = 0.409). The statistical comparison is, of course, restricted by the low sample size: however, all products available on the German market at the time of sampling were included. To finally confirm that there is in fact a difference between food and medicine products, a larger Europe-wide sampling needs to be conducted. The explanation for the higher thujone contents in medicines than in foods could be twofold: on one hand, the European Pharmacopoeia  specifies minimum contents of essential oil for sage leaf drugs and also states the characteristic that "sage leaf oil is rich in thujone". A qualitative thin-layer chromatography test for thujone is also included in the identification assays specified in the Pharmacopoeia . On the other hand, previous EU legislation  had specified a maximum thujone content of 25 mg/kg in food containing sage (in the final product ready for consumption). It can be speculated that food producers previously selected low-thujone varieties (i.e. the low-thujone chemotype), while medicine producers selected oil- and thujone-rich varieties (i.e. the medium and high chemotypes) to fulfil the Pharmacopoeia demands. As mentioned in the introduction, it must be stressed that in the newest amendment of the EU flavouring laws , the limit for sage products was omitted, so that currently no maximum limit for food applies anymore. This might lead to rising contents in the future, as no legislative pressure may exist anymore to select the low-thujone chemotypes, which may now be substituted by other selection criteria such as price and quality. Regarding the exposure assessment from tea, the literature has described thujone contents of 0.3 mg per cup , and EMA has estimated a thujone content of 0.7 to 5 mg per cup from the data of Länger . The analysed food teas (n = 8) showed a thujone content ranging from 0.03 to 2.14 mg per cup and a camphor content of 0.23 to 6.57 mg per cup. The analysed medicinal teas (n = 31) showed thujone contents ranging from 0.03 to 4.56 mg thujone per cup and 0.35 to 8.25 mg camphor per cup. Although our results confirmed the range previously made in estimations by EMA, our data show that the maximum content of thujone per cup of tea is actually lower than assumed by EMA. The situation for camphor is different. EMA estimated a camphor content of 0.53 to 2.3 mg of camphor per cup. Our results show that the actual content is up to three times higher for products sold as food and up to four times higher for products sold as medicines. As expected, we found the highest contents of terpenes in the fresh sage samples (n = 5), ranging from 223 mg/kg to 1901 mg/kg for thujone and from 821 to 2610 mg/kg for camphor. Dried sage leaves sold as food ingredients (n = 3) showed a thujone content of 944 to 1353 mg/kg and a camphor content of 1651 to 4322 mg/kg. Candies (n = 4) contained 3.3 to 8 mg/kg thujone and 87.3 to 312 mg/kg camphor (Table 3). Apart from the teas, we also analysed various medicines containing sage (Table 4). Overall they showed thujone content ranging from not detectable to 492 mg/L. Interestingly, in the analysed sage juices (n = 3), neither thujone nor camphor were detectable. Therefore, the question arises as to which part of Salvia was used in the preparation of these products, or if any part of it was used at all. In light of our extraction experiments and literature data , tinctures (or alcoholic extracts) expectedly showed thujone contents from 135 to 492 mg/L and camphor contents of 203 to 883 mg/L higher than aqueous formulations. Finally, we analysed semi-solid formulations for use in the mouth (such as teething gel or gum gel) (n = 4). The analysed thujone content ranged from 35.3 to 335 mg/kg. So-called herbal sedative tinctures had thujone contents ranging from not detectable to 18.3 mg/kg. Notably, tablets (antispirant tablets, see Table 4) with the indicated traditional use to reduce sweating, showed the lowest thujone concentrations of 0.2 to 3.7 mg/kg. We analysed 3 different brands (Table 4). Two brands (brand 1 and 2) contained dry extract of Salvia gained by aqueous extraction. We did not find detectable amounts of thujone or camphor in these preparations. The information provided by the manufacturer states that the tablets contain 80 mg (brand 1) and 300 mg (brand 2) of a dried extract of Salvia obtained by an aqueous extraction. Therefore, a low content of thujone can be expected. Brand 3 claims to use crushed dried sage leaves (200 mg per tablet). We analysed a thujone content of 3.7 mg/kg. This means that every single tablet (weight: 0.45 g) contains 0.0016 mg of thujone. Calculating tablet and recommended daily dose (3 × 1-2 tablets) shows that with a daily dose of 6 tablets the consumer would take up 0.0096 mg of thujone per day, which is considerably less than the exposure from tea. Of course, the question arises about the possible active compounds in such applications. In this case, the results of the FC-Index hint that other compounds are active substances in the formulation, probably the polyphenols, which are also extractable to some degree by water. The legal status of thujone products when sold as food and when sold as medicines is considerably different. While standards for foods have been in existence for several decades, acceptable daily thujone intakes for medicines were only recently proposed by the EMA . By using the data of the National Toxicology Program and a BMDL-ADI approach, Lachenmeier and Uebelacker  proposed a limit of 6.6 mg/day. EMA reacted with a public statement reconsidering the published ADI and proposing a new ADI in a similar region of 6 mg/day . This means that up to 6 cups of average food sage tea or up to 3 cups of average medicinal sage could be ingested daily without reaching this intake level. Therefore, we currently see no risk associated with the occasional food or medicinal use of sage (especially in the traditional use as herbal tea). The collection of data concerning sage preparations should be expanded in the future, preferably compounded by a quantitative risk-benefit analysis. Horst Mann and Hana Havel are thanked for exceptional commitment in operating and maintaining the GC/MS system. Hannelore Heger, Christina Diehl and Jeanne Mildenberger are thanked for their excellent technical assistance including sample preparation and analysis of FC index. No funding was specific to the production of this manuscript. The salaries for authors were provided by the affiliated organizations. SGW contributed to the conceiving of the study, conducted the sampling and sample preparation, supervised the GC/MS measurements, and conducted the final data analysis including statistics and drafted the manuscript. DWL conceived of the study, coordinated the laboratory work, supervised the measurement of FC index and drafted the manuscript. TK developed the original GC/MS methodology and supervised the GC/MS measurements. TK and WS revised the paper draft. All authors read and approved the final manuscript.